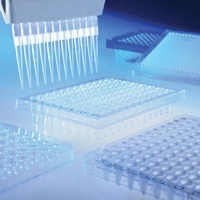 RAININ says the thin-walled polypropylene used in the construction of its FrameStar PCR plates gives better heat transfer and makes for faster and more efficient thermal cycling when using polymerase chain reaction (PCR). A rigid, thermally-stable polycarbonate plate frame supports the polypropylene wells to maintain the plate’s integrity and deliver what Rainin says is superior performance. Polypropylene is used for the wells because of its chemically-inert properties and low binding capabilities for nucleic acids, proteins and other molecules. The polycarbonate frame provides thermal and structural stability and preserves seal integrity, which in turn minimises evaporation. This means that lower reaction volumes can be used, saving money on expensive qPCR reagents. The rigid frame also facilitates robotic handling, with a more secure grip and placement at different stations, reducing dropping and jamming during mechanised manipulation. Anachem is offering a introductory discount on FrameStar PCR plates to readers who quote offer code DM401. Please mention Labhomepage when responding!